A Swing Boat is a fairground ride in which pairs of riders pull ropes to swing back and forth. At the national jamboree, it’s one of the pioneering area’s favorite features. Click here for more information. This is a smaller, more boy-sized version, but still lots of fun and plenty big enough. After completed, the A-frames are stood up and held in place while other construction continues. 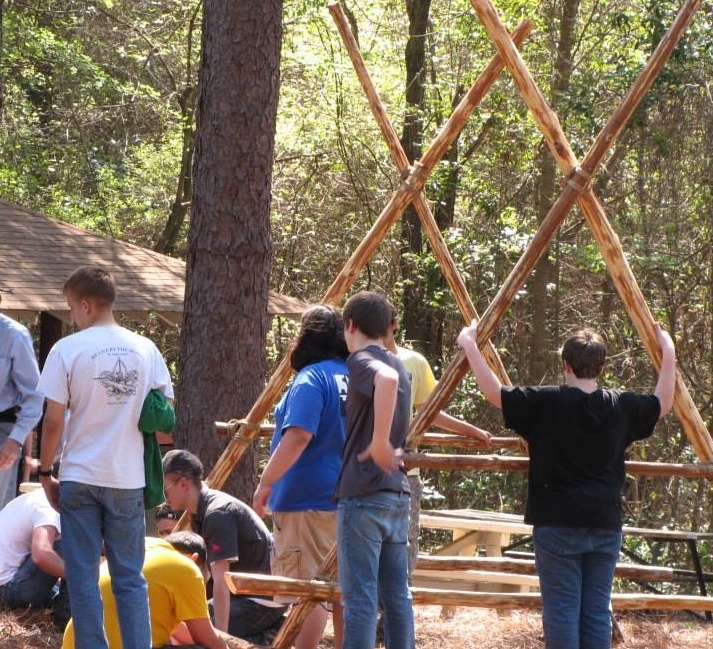 Build the A-frames. 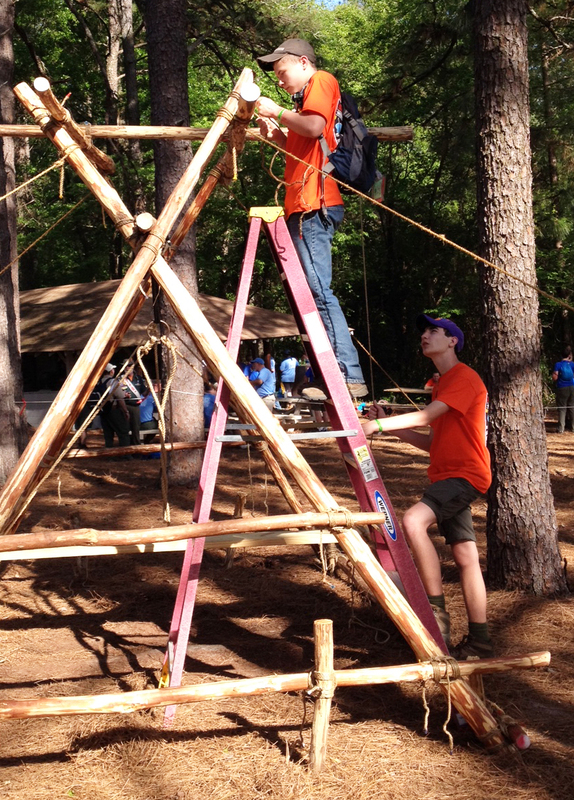 Using 20-foot ropes, lash two identical A-frames. The tops of the shear lashings needs to be approximately 3 feet below the tips of the 12-foot legs. (In lieu of shear lashings you might want to join the legs at the top with looser square lashings applied with the legs held at 90º after which the legs can be brought into the desired position to add the ledgers, but in doing so, make sure there won’t be too much strain applied to the top rope and the spars.) The 10-foot ledgers need to be approximately 1.5 feet above the butts of the legs. Lash on an additional 6-foot cross spar for extra support on each A-frame. Join the A-frames together. 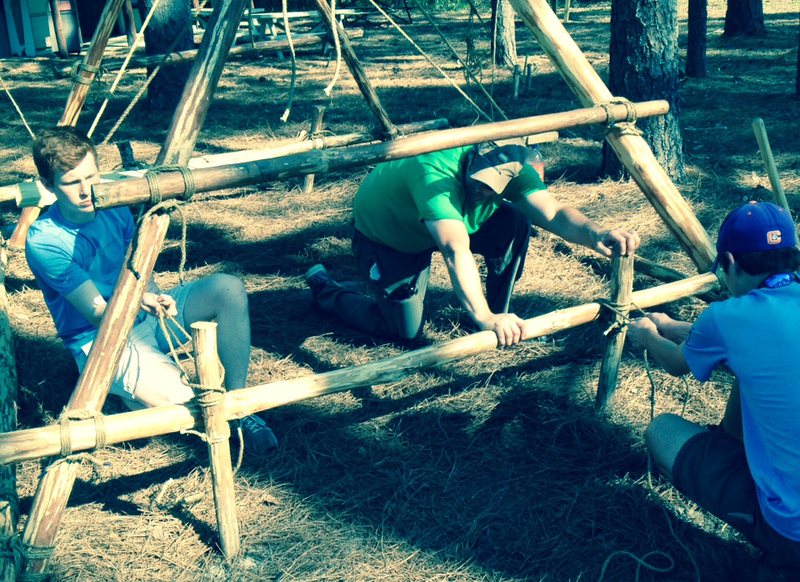 Stand up the A-frames and holding them in place, use the remaining 12-foot spars to join them together. Lash these on as low as possible so they don’t interfere with the action of the swing. The following steps can be carried out using an 8 to 10-foot folding step ladder or by laying the structure on its side. Either way, strong crew members will be needed to hold the spars in place. Attach the pull rope spar and pull ropes. At right angles, lash a 10-foot spar across the center for the pull ropes. About 6 inches from the ends, tightly tie a 15-foot pull rope to each end using a roundturn with two half hitches. Attach the swing. Attach a swing rope to each end of the prepared plank with a scaffold hitch. Using a roundturn with two half hitches, tie the ends of each swing rope securely to their corresponding ring -or- directly to the center spar about 6 inches from the legs of each A-frame. Prepare the anchors. Drive in pioneering stakes for four 1-1 anchors extending 20 feet out from the legs at 45º. Attach the corresponding guyline to each using a rope tackle. Also, drive in a stake about 6 inches in at each of the four corners so they will intersect with the A-frame ledgers. Lash each stake to the corresponding ledger with a square lashing. Make adjustments. Level out the plank to the desired height and adjust the swing ropes so the swing hangs evenly.